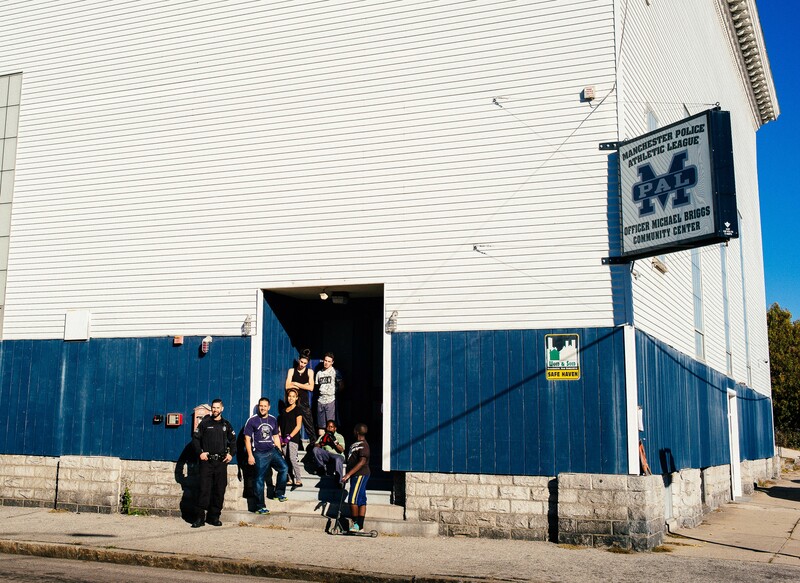 The Michael Briggs Community center, which was named after an officer who was tragically lost in the line of duty in 2006, provides a safe and positive afterschool environment available to the over 8,600 inner-city youth within one mile of it, and provides an alternative to harmful behavior and encourages positive relationships between law enforcement and young people. The center is in desperate need of repair, and for nearly a year, Building on Hope has organized volunteers and solicited donations from dozens of businesses to help with the renovation. Build Week takes place this year from May 13 – May 22 with a celebration and grand re-opening starting at 12pm on the 22nd. Volunteers have already contributed to renovations in the first phase of construction which included installing a new HVAC system, demolition of the interior, installation of new electric wiring, walls, floors, a $25,000 kitchen remodel and more. 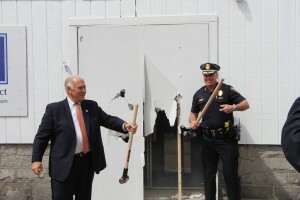 With the support of Building on Hope, local businesses and donors, volunteers will complete the final phase of the 16,500 square foot building’s overhaul, and will have the chance to aid in the creation of transforming the Michael Briggs Community Center into a state-of-the-art, 17 room facility that will improve the reality of Manchester’s inner-city youth. MPAL strives to foster and maintain positive relationships between the youth of the Greater Manchester area and members of the Manchester Police Department. MPAL’s Michael Briggs Community Center offers area youth a safe, structured environment to help kids grow, make the right choices and become productive members of the community. By providing mentoring along with sports and academic instruction in the afterschool and early evening hours, MPAL believes in making champions both in and out of the gym. All programs are free, and kids enjoy judo, aikido, wrestling, boxing, rugby and lacrosse in addition to receiving academic help from Manchester police officers. Once it reopens, kids will be able to use brand new computers for homework help, play on new gaming systems, participate in community and movie nights and have more established areas for each designated activity. 2010: Easter Seals – The remodeling, landscape, redesign and refurnishing of the White House Boys Intensive Residential Treatment Facility. Located in Manchester, this building is home to five boys who, for any number of reasons, cannot live with their families. Many residents here suffer from behavioral problems, learning disabilities and other setbacks. Most have experienced severely traumatic life experiences along the way, but they come to the White House because they are working through those problems and have plans for a better future. 2012: Girls Inc. – The Manchester Girls Inc. headquarters was in need of major renovations to better serve the hundreds of girls and their families participating in its programs. The project involved a new roof, an air conditioning system, playground, extensive program enhancements and a completely new kitchen and dining area. 2014: Opportunity Networks – At its core, Opportunity Networks in Amherst is committed to providing genuine vocational opportunities and activities that promote life enhancing skills for adults with developmental and acquired disabilities in the Greater Nashua/Souhegan Valley community. The project centered around the ‘dreams’ that the Opportunity Network Board and Staff had to provide additional services and value to their clients. Building on hope provided a fully interactive theatre, library, art space, commercial kitchen, movement room, computer lab, renovated offices and a ‘snoozelen room’. Manchester Mayor Ted Gatsas and Manchester Police Chief Nick Willard break through the entrance of MPAL’s Michael Briggs Community Center to celebrate the kickoff of Building on Hope’s Build Week 2016. Manchester Police Chief Nick Willard thanks Building on Hope in front of the dozens who came to the Michael Briggs Community Center on Monday during the groundbreaking celebration outside of the MPAL building on Monday. Gibran Ortiz-Perez (on the microphone), a former MPAL student who is still heavily involved with the Michael Briggs Community Center, is joined by, pictured from left to right, E.J. 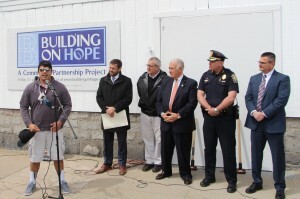 Powers (Building on Hope Steering Committee), Jonathan Halle (Building on Hope Co-Chair), Mayor Ted Gatsas, Nick Willard (Manchester Police Chief) and David Mara (Chairman of MPAL) to address volunteers and supporters of Building on Hope during the groundbreaking ceremony which took place outside of MPAL on Monday afternoon. 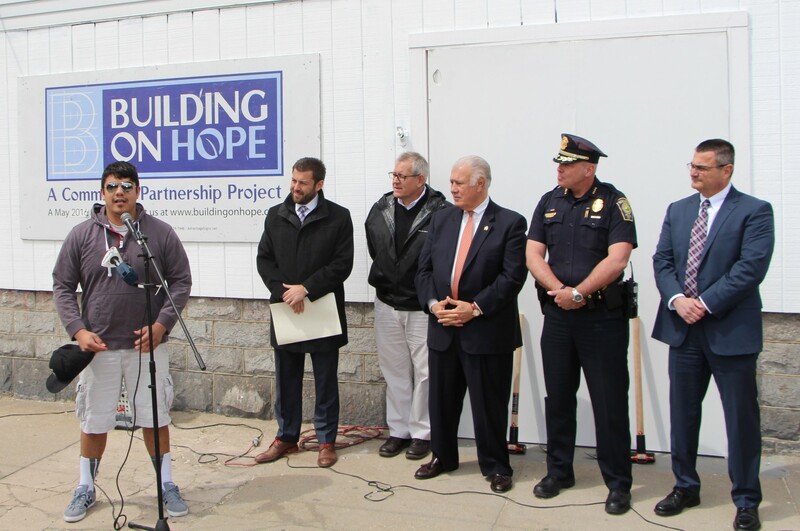 Manchester Police officers and MPAL students gather outside of the Michael Briggs Community Center, the nonprofit that was selected by Building on Hope to receive a full renovation which will be completed by Sunday May 22nd, and celebrated with the community starting at noon that day. Photo by Matthew Lamanno. 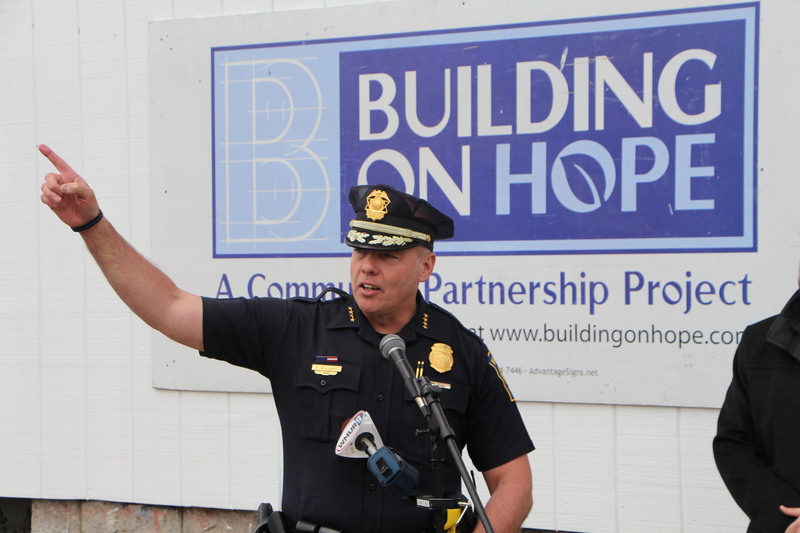 ← Building on Hope groundbreaking moved to Monday at 2 p.m.